The McGregor-Khabib brawl was appalling. As MMA fans, we are used to seeing fighting in its isolated, sanitized form: in the cage against the grey of the canvas with the lights turned up bright, every muscle on the fighter’s bodies standing out so you can see. Here, now, was the real thing, in front of us. Fighting like you see outside a bar, or during a gang initiation. As the brawl broke out, it was a reminder of the true nature of violence– chaotic and ugly, exploding in crude opportunistic bursts. Fists flying, bodies falling, struggling. No baby-faces or heels, no spinning head kicks or slick jiu jitsu moves, just men pushing and shoving and swinging. MMA represents the civilization of violence. Martial arts are a way to bring order to the chaos of combat. From the safe distance of outside of the cage, we can watch appreciatively as MMA fighters struggle as if for their lives. We see them bare their souls, re-enacting a primeval struggle for survival. In their training, they seek to break down the maelstrom of a full-on fight into a regimented, watchable sporting event. There is a world of difference between mutual combat among two trained martial artists under agreed rules, and the sort of skullduggery that you can find on World Star Hip Hop. The world has not been able to watch MMA without in some part appreciating the melding of intense discipline and savagery and grace. By 2018, MMA seemed to have dragged itself out of the “human cockfighting” pit that early promoters like Art Davie had put it in with their gruesome marketing of the initial events, which hinted that the fights might be “to the death.” It had now gained respectability. Fox Broadcasts. Men in suits sitting at a desk and discussing it afterwards. It was a sport now. Champions like Ronda Rousey and Conor McGregor had become household names. Money was flowing. The world was now watching. 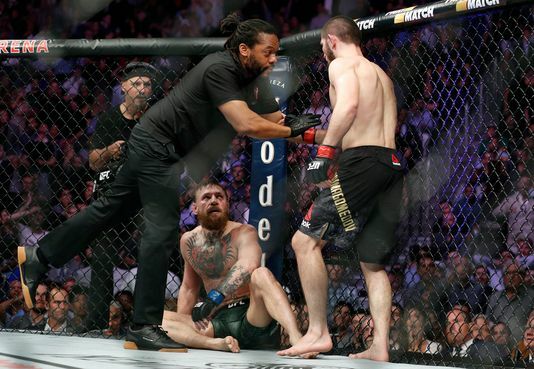 As Khabib hopped over the fence and dropped, kicking onto one of McGregor’s cornermen, I felt as though it was all crumbling. Everything that fighters like George St Pierre had spent the last twenty years convincing the public that MMA wasn’t, poured into the octagon like a leak in the hull of the sport’s propriety. As a fan, it felt humiliating. MMA has always struggled to get the respect it is due, and slowly it had seemed to win minds over. Viewers had begun to be able to see past the chain link fences and the blood, and the barbed wire tattoos, to the underlying, undeniable art of it. This brawl would set us back. There is no doubt that UFC president Dana White created this situation by giving a nod and a wink to McGregor’s violent antics. Shaking his finger after the Irish superstar tossed a dolly through the window of a bus Khabib was on, and then turning around and using footage of the attack in a promo for the fight, he had clearly made an exception for the Irish superstar. While there was little question that the Dagestani Sambo champion had done wrong, it was hard not to see how Dana White had created this situation. I went to bed that night depressed, feeling as though an otherwise fantastic night of fights had been marred by this ugly incident. Perhaps I misjudged the new audiences that MMA’s success had brought. That next week, CNN’s website ran multiple headlines about the UFC on its front page. Not just about the brawl, but about the status of the championship, and the role of former champ and current contender Tony Ferguson. I glanced over a news-item stating that UFC 229 had been the second most lucrative UFC event of all time, with a gate of $17.2 million. My brow furrowed. Had this brawl, in all its ugliness, just pushed MMA further into the mainstream? In the age of Trump, disqualifying actions become attractive features. The poles seem to invert. Maybe this brawl, so disturbing as it happened, would not “play” as I had imagined. Compilations of car crashes and brutal Russian street beatings are some of the most popular videos on Youtube. Traffic slows down on the highway so people can rubberneck a five car pileup. Maybe MMA was destined not to rub shoulders with baseball or football as mainstream accepted sports, but would fall into the same niche as Nascar. The car race draws plenty of motor heads and speed freaks, sure. But the secret of its stickiness is that a portion of the audience just wants to see a crash.